The washing plants hydrokinetic exploiting the mechanical action of the liquid [base detergent and water or water-based products] moved at high pressure and in large-scale inside a washing chamber that houses an equipment-carrying rotary drum. Typical applications are the treatment of high amounts of mechanical parts turned, inserted into large baskets containment but it is also frequently the case in which are inserted directly pieces of large dimensions. The combined action of the liquid so moved, and the rotation of the pieces on its axis promotes the washing of all the oily residues but especially from all the processing residues. 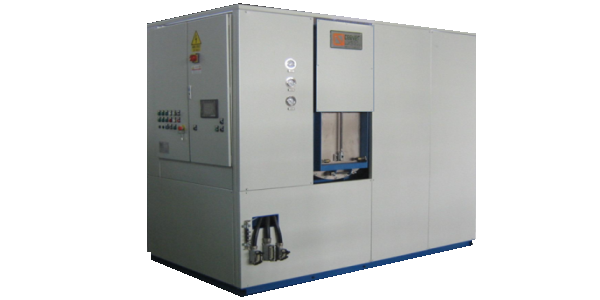 The wash cycle is based on a phase spray and immersion with a strong agitation of the cleaning solution. In this way it combines the action of the chemical degreasing agent with the mechanical action of the jets. Following a possible rinsing and finally drying with air or air and vacuum. These systems are therefore recommended for washing between processing steps, or more generally, when the parts to be washed are complex with diversified shapes and sizes, with many blind holes or passages particular, dirty chips and machining residues. This is an extremely reliable solution, compact, flexible, ideal for production of reduced volume and which allows to obtain good levels of cleanliness.